The monarch is the head of state but does not have absolute power like in an absolute monarchy. The monarch is the chief ambassador, negotiates treaties, and appoint and recieve other ambassadors. The monarch can propose laws and veto laws suggested from the other branches. The hereditary succession of the Sun and Moon Kingdom is not like other monarchies. While most monarchies are a male-preference primogeniture or an equal primogeniture , the Kingdom's succession is an alternating primogeniture. 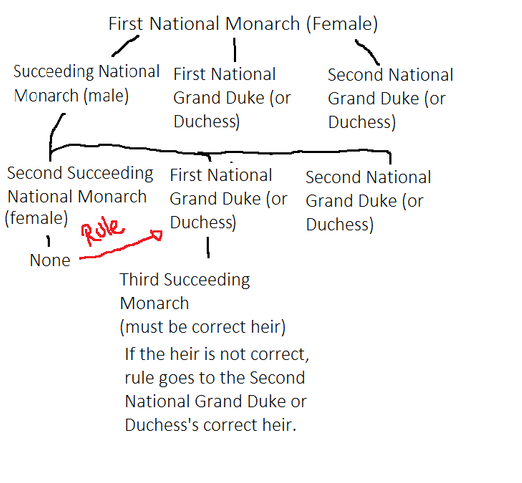 This means that if the current monarch is a male, his successor will be female, then hers would be male. In the event that a monarch cannot produce the correct heir but has children, the throne goes to the first-born. If without children, the rule will go to the grand duke or duchess of the monarch (i.e. the monarch's next oldest brother or sister. )Their next heir must be the correct gender following the monarch before the Grand Duke or Duchess. (i.e. if the monarch before the Grand Duke/Duchess was female, the successor must be male.) If the successor is not correct, rule goes to the Second National Grand Duke/Duchess's correct heir. The heir is eligible to rule by the age 18, excluding the first national monarch. If the successor is not of the correct age, rule goes to first national Grand Duke or Duchess. The legislative branch is similar to one of the United States. The legislative branch makes the laws of the land. The legislative branch will have a Senate and a House of Representatives. Not much has been decided about this branch and how it will operate. The judicial branch is also similar to one of the United States. This branch interprets the law of land and deals with court cases. Not much has been decided about this branch either.